My latest article on mathematics education, titled “Developing Intuition for Logarithms,” was published this month in the “My Favorite Lesson” section of the September 2018 issue of the journal Mathematics Teacher. This is a lesson that I taught for years to my Precalculus students, and I teach it currently to math majors who are aspiring high school teachers. Per copyright law, I can’t reproduce the article here, though the gist of the article appeared in an earlier blog post from five years ago. Rather than repeat the article here, I thought I would write about some extra thoughts on developing intuition for logarithms that, due to space limitations, I was not able to include in the published article. In this series, I’ll discuss a technique that Algebra II students can use to find the decimal expansions of base-10 logarithms to surprisingly high precision using only tools that they’ve learned in Algebra II. This technique won’t be very efficient, but it should be completely accessible to students who are learning about base-10 logarithms for the first time. All that will be required are the Laws of Logarithms and a standard scientific calculator. A little bit of patience can yield the first few decimal places. 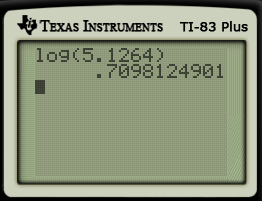 And either a lot of patience, a teacher who knows how to use Wolfram Alpha appropriately, or a spreadsheet that I wrote can be used to obtain the decimal approximations of logarithms up to the digits displayed on a scientific calculator. I’ll start this discussion in my next post.